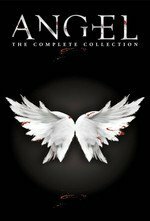 Angel Investigations finds a new home base, but first Angel has to take care of some old business. We find that Angel had been living in the Hyperion in the 1950s while a demon fed on the paranoia of the residents. Angel abandoned them to the demon then, but returns to exorcise it. David Boreanaz and writer/executive producer Tim Minear have cited this as one of their favorite episodes of the series. I'm on board with this as a top episode, especially in the early part of the series. Maybe the first truly great one? I have more fun with the Faith episodes in S1, but this is marking darker territory than BtvS. For the first time, Angel outright rejects humanity, too flawed to try to save no matter how much he may be drawn to help. The show reaches operatic heights in the next few years, exploiting the faultlines of Angel and the other characters for pain that feels much sharper than Buffy's usually did. Angel will turn his back on humans, friend and foe more than once this season. Anyway, gorgeously designed period piece, fun and moving characters, super creepy demon and a cool new base of operations that will serve the show well. Excited for the good stuff to start up! It's always comforting when producer/actor favorite episodes are actually good episodes. With some shows, I have the feeling that I like the show for entirely different reasons than the creators intended (or they just feel the need to stick up for terrible episodes by claiming that they are actually very good). The Citizenship exam still requires people to answer the titular question (Are you now or have you ever been a member of the Communist Party?). It's bizarre. "It's not that vampires don't photograph. It's just that they don't photograph well." ILU Cordy and I love how they just hang a big ol' lantern over the science of vampire photography. I once rented a car and drove up to LA after attending a convention in San Diego. I was by myself and I visited Sunnydale High (Torrance), Buffy's house (just a couple blocks from the school), and the Hyperion (on Wilshire, on the edge of Beverley Hills). It was a blast, nearly as much fun as the more respectable attractions, LACMA and La Brea Tar Pits (the site of the Inca mummy girl episode).